Two Saturdays ago I was thwarted at my local farmer’s market in Fort Greene, Brooklyn. 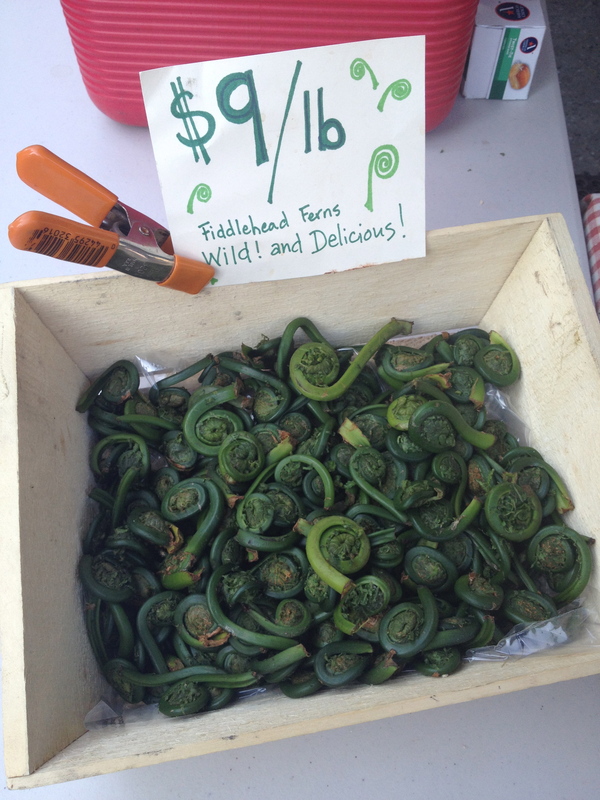 I walked over at 9 am, canvas tote in hand, and headed to the one stand that is known to carry fiddleheads during their fleeting three-week run at the markets. “Just sold the last ones,” the farmer told me, not without a proud smile crossing his face. And then he pointed to the couple who scored the last fronds. They looked pleased with themselves. He tried to get me to buy some stinging nettles instead, which are basically the opposite of fiddleheads—whereas fiddleheads are furled, introspective, and soft, nettles have tiny stingers pointing out from the leaves daring you to touch them, let alone eat them. Fiddleheads are coy, nettles defiant. I passed on the nettles (although I do quite like to eat them) and was reassured he’d have more fiddleheads the following week, and maybe, but not likely, the week after that. Now what to do with these sleeping beauties? I like to just steam or sauté them, dip them in a little melted butter, or serve with fish and rice. But I had an idea. I passed one of those bakery stands at the market that sells hearty loaves of rye and cheddar scones, and noticed big, thick slices of focaccia. Aha! 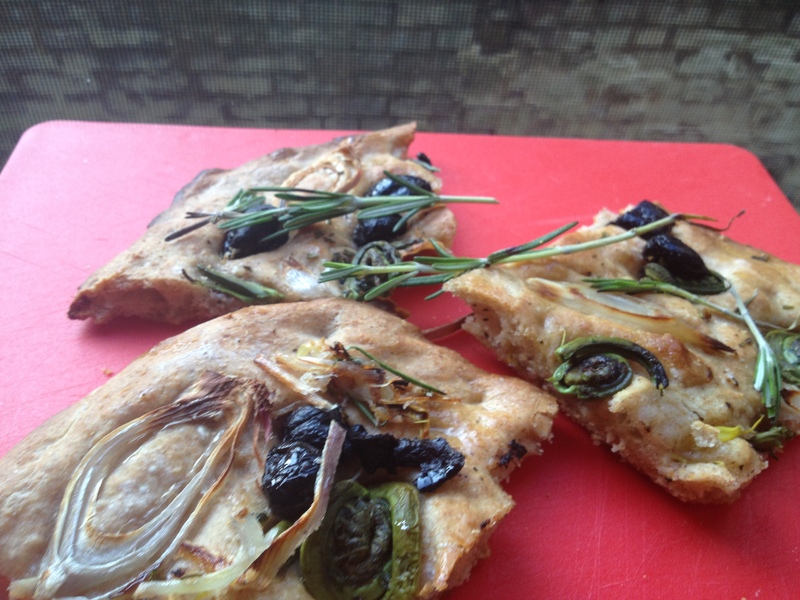 What about fiddlehead focaccia? After all, the first time I had fiddleheads they were served on bruschetta; focaccia wasn’t all that different. And the fiddleheads could roast up nicely on the dough, along with any other toppings I decided to add. So I bought some Kalamata olives, rosemary, and shallots and set out to make the dough. This recipe requires a bit of time because you have to let the dough rise twice—the first time for at least an hour and a half, the second time for about forty-five minutes. So it’s a good thing to make on a lazy weekend when you can fiddle around in your kitchen, then go do something else for a while, then come back, then do it again. 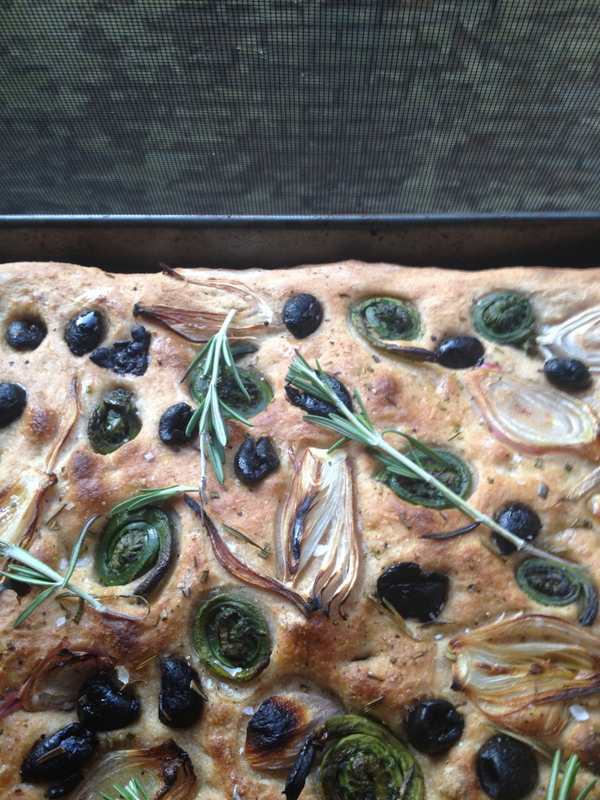 I was pleased with the results — turns out fiddleheads work well with the flavors of rosemary and olives. The bread is salty, crunchy, and let’s face it, rather pretty and springy, no? Add the flour and salt to the yeast mixture and set the mixer to a medium speed, using the dough hook attachment. Mix for about 10 minutes, until the dough starts to come together and almost forms a ball. Oil a separate, large bowl, and add the dough, formed into a ball with your hands, to this bowl. Turn it around in the bowl so it gets coated with the oil. Cover with plastic wrap or a cloth towel and let it stand in a warm place until it doubles in size, about 1 1/2 hours. Punch down the dough, knead it into another ball, and return it to the bowl. Let stand until it doubles again, about 45 minutes more. Preheat the oven to 450 F. Grease a baking sheet with oil. Transfer the dough to the sheet and spread out with your fingers. Drizzle with olive oil. Let the dough rest for about 10 minutes. Then add the fiddleheads, olives, shallots, rosemary, and a sprinkle of salt and black pepper. Push the ingredients into the dough, and make more indentations with your fingers throughout the dough. Bake for 15-20 minutes, until the dough starts to turn golden brown. Remove from oven, and serve warm or at room temperature.